Robert Taylor's wonderfully realistic painting captures the very essence of that epic battle. A Heinkel III has been brought down, one of many never to make it home on this bright and sunny day. 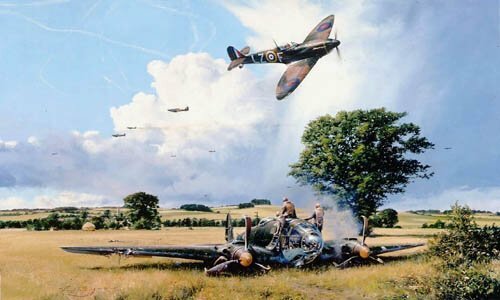 As the Luftwaffe bomber's crew emerge from their broken aircraft, relieved to have survived the crash-landing, a Mk I Spitfire from No 66 Squadron roars low overhead to verify another victory. The tightly restricted ACES EDITION is limited to just 500 copies world-wide, each signed by six Battle of Britain Spitfire pilots. The highly exclusive MILLENNIUM PROOFS comprise only 250 copies for world-wide distribution, each signed by an additional 19 Battle of Britain Spitfire pilots.